Because I want to remember it all...: Blah. I learned a lesson this week: I can't get away with just doing ponytails in Cecilia's hair. I tried it and it looked like a hot mess after about a day. 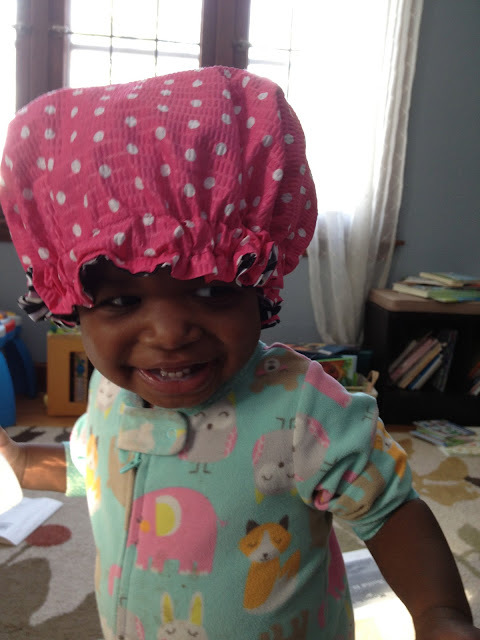 I bought her a sleep bonnet that I thought might help preserve her hair during the sleeping hours, but how do you convince a one year old to keep a freaking bonnet on? You don't. You put it on and watch her take it off. Over and over. And subsequently, you watch her hair fall further and further into disarray from all the on and off defeating the purpose altogether. This thing is my new ridiculously cute enemy. Anyway, as I mentioned the puffs weren't cutting it so I had to figure something else out. This style has been working great for us for the past few weeks so I'm sticking with it! Another hair related obstacle that we are trying to overcome is the fact that she loves to be naughty. She will go up to anything she thinks is off limits, look at me, touch it and laugh maniacally. She has figured out that mama doesn't like it when she messes with her locks so she will touch it just to be sassy. I'm learning to just try to distract her with anything rather than letting her know just how crazed I feel inside when I see her grabbing at all of my hard work on the top of her head. Do you see how much she is loving being naughty?? I've had this weird illness since last weekend, basically a scratchy throat evolved to a very sore throat, then laryngitis then a deep cough. By Wednesday Simon joined in the fun. He never complained about a sore throat, but he's not great at telling me what hurts so who knows. Today his cough is deep and sounds painful and he's got a little fever to boot.